I got my second Stitch Fix box last week and wanted to share with you what came in it! You can see my first SF blog post here. I signed up for quarterly fixes, and I was excited when I got an email saying my box was on the way. 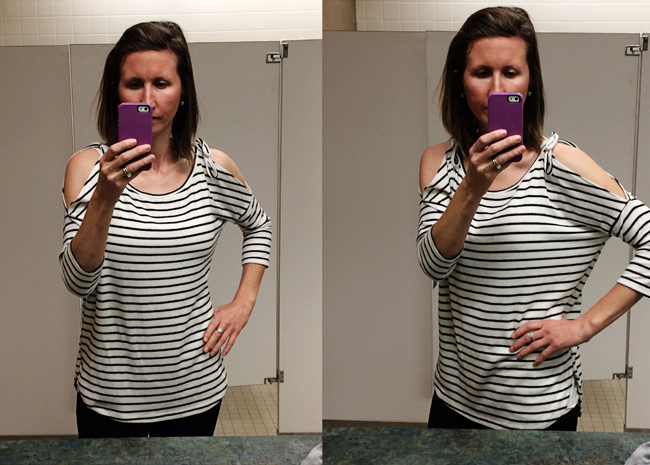 After being curious about Stitch Fix for a long time, I now admit I can totally see why people love it. It is really quite fun to get a box in the mail full of clothes to try on at home. It comes with a personalized note from your stylist and a prepaid envelope, so sending back the clothes is super easy. Get a box for free and waive the first styling fee by signing up using my referral link. I'll get some money too, so thanks in advance, friends! If you will recall, even though I only kept one item from my first SF box, I was very happy with the clothes they sent, which all felt like my style. This time I requested tops and some colored pants, and once again my box had some great things! I was also happy to see that the prices for the items was not as high as last time. The most expensive thing were the jeans at $58 (my last box had a pair of jeans that were $98! No.). I debated about a few items but ended up keeping just one thing. And yes, I took these pictures in my office bathroom. Just getting that out in the open. I'm not going to say I will never wear a shirt with open sleeves like this, because I've said "never" to a few fashion trends that I ended up liking a lot (example: skinny jeans and printed leggings). However, at this time I'm still not in love with this look. My arms felt weird (cold? haha), the straps at the top were too narrow to accommodate a bra strap, and the ties at the top are not going to stay in place when I'm holding J, who loves pulling at and sucking on stuff like this. The shirt itself was super comfy and I loved the sleeve length, but still. Return. I loved this top too! It was really comfortable and fit well. Again, I have a top that's similar (although a much darker wash), but the main thing that swayed me against it was that the buttons were super hard to get undone. I know that's a weird thing to focus on, but as I was unbuttoning the shirt I was like, "yeah, I can't handle these." I also don't have time in my life to own another shirt that will need ironing. But I appreciate another nursing-friendly option! This top confused me. When I first put it on, I was like NOPE. I felt like I was wearing a tent or about to take flight or something. But then I put my arms down and messed with the sleeves and realized I actually really liked it and it was super comfy. So I took an Instagram poll, as one does, and the majority of people said it was cute and to go for it (although I also was told by someone to burn it lol!). I ultimately decided that I wasn't yet comfortable enough with this (totally weird!) style to justify the cost. This shirt was $36 (not terrible! ), but I thought maybe I can find a $10 version and ease my way in. I specifically requested a pair of colored pants. Some of you old-timers may recall my green Gap jeans, which I've worn for years, including through the majority of both pregnancies. I love my green pants. However, I've noticed recently that they seem to be showing signs of their age. I definitely stretched them out wearing them during pregnancy, and they don't fit as well as they used to. I would never have chosen a pair of purple jeans for myself, but I kind of love them. Will they replace my green jeans? Probably not. Purple doesn't feel as versatile, and they are, like, very purple. But they fit well and seemed too cute to send back, especially considering I had some extra Stitch Fix credit to use up and the $20 styling fee to apply. Keep! Interested in trying out Stitch Fix for yourself? Sign up using my referral link and get your first box free! If you hate everything, send it all back in the prepaid envelope. But who knows? You might find something you love! What do you think of my box? What would you have kept? Do you have any colored jeans? I like button down shirts I just don't like them for me. They just don't seem comfortable to me. I also think that might be hard nursing to have to unbutton. I'm glad you like your Stitch Fix boxes. I haven't got one and I doubt I will because I have an Athelta problem currently....... love that store! I don't like cold shoulder tops so that's probably the only thing I would have sent back. The rest fit really great on you & looked super cute. I am not a fan of purple at all, but those jeans are super cute on you. This is why I had to quit SF - I was keeping all these clothes that looked super cute & I never wore them because let's face it. I work out and I'm a nurse who wears scrubs. That's my life. I don't wear cute clothes! ok I LOVE that first top, it is sooo cute!! I wish I would have gotten that one in my box. I feel like everything you got was great while my second box on the other hand was not so great. haha I only kept one item and scheduled another fix for April to see if they would redeem themselves. I agree that I can't get into the cold shoulder trend. I do love the polka dot top though as well as the purple jeans! I’m not into the cold shoulder look and like we’ve discussed, I would be constantly dragging the baggy sleeve and bell sleeve shirts in food and stuff. The purple jeans are so cute and I bet you’ll be surprised at how many things go with them. 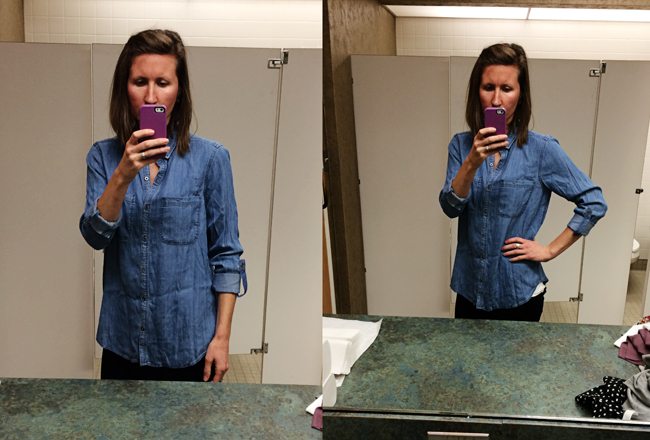 I’m thinking the darker chambray top you mentioned above would look really nice! Speaking of, I like the Stitch Fix chambray but totally would have sent it back too if the buttons were annoyingly tough! I can’t do the cold shoulder shirts. I hate them. Passionately. I love the purple jeans! Really really love them. Good choice. I go back and forth with the cold shoulder tops. It's hit or miss for me. That said, I think that one is super cute! I like that bat-like top! I think the sleeve/seam placement would bother me, though. Love those jeans! Perfect color for spring! The jeans! They are so great! I've seen some really cute outfits that incorporate colored jeans, but I haven't found a pair I loved enough to buy yet. You are inspiring me to keep looking, though! I think those colored jeans look great on you. I'm not much into the open shoulder hole fashion going on right now either. It just doesn't look good on me. For what it's worth, I think you made the right call on the gray tarp. My 9-year-old happened to walk by when that picture was up on the screen and said, "What is THAT?" I'm still in love with the gray top! 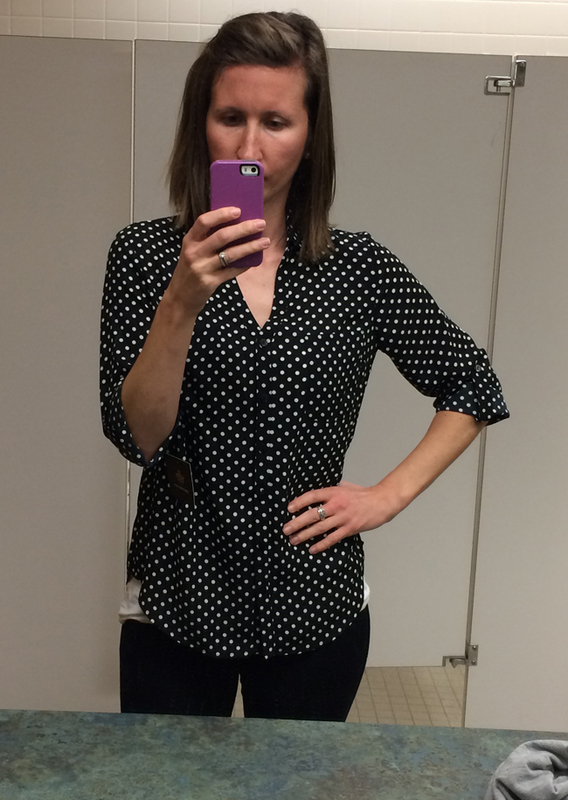 I have a black one that's really similar from Stitch Fix and at first, it felt weird, but I love that shirt. It's so comfy and looks great with a long necklace. It's great for days where you are feeling kind of bloated. I absolutely love those colored jeans!!!! So fun! I love the jeans! So fun! I'm obviously way behind here, but I do love those jeans! So fun for spring! I also LOVE #1 and #3, but I'm with you on the open shoulder hole thing...still not sure if I could pull it off? I've been wanting to try StitchFix for the longest time. I actually have a few friends down here who are stylists! 100% agree with your choice! I love those pants!! I love Stitch Fix but I usually only let myself keep one thing! 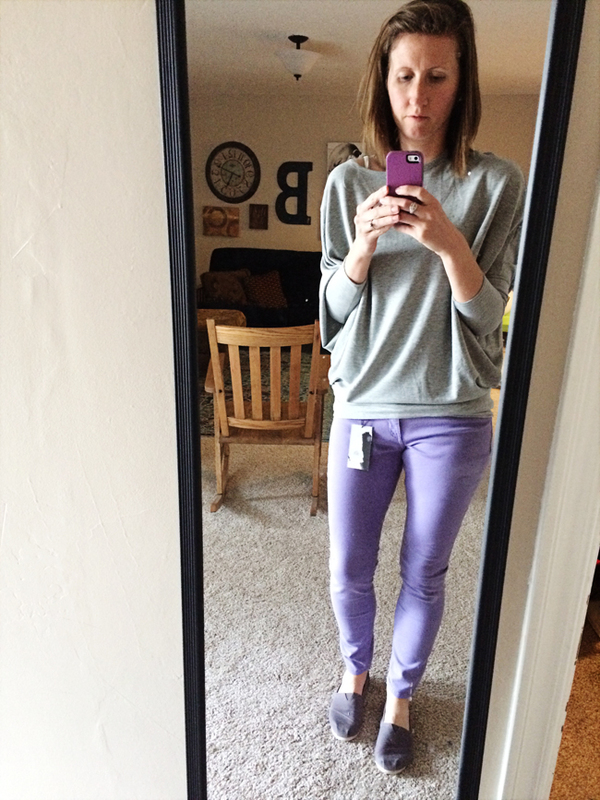 LOVE the dolman top and the purple jeans!! Baby's First Snacks with Gerber! Fun Weekends + Our First Family Fun Run!